Mekasz Chasidi Viznitz never stops to surprise us with great music. 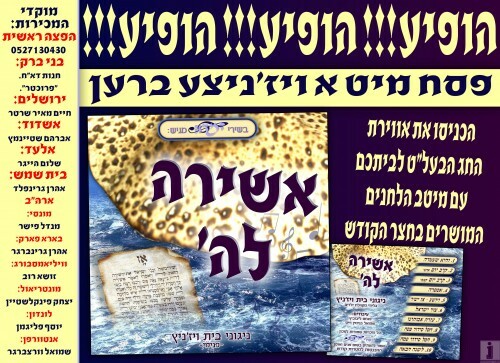 For the upcoming yom tov of Pesach they released a new album with the best tunes sung in the “Chatzer Kodesh” of Viznitz accompanied by a children’s choir. The album boasts ten amazing tracks of the best songs for Pesach, including two versions of “Korov Yom” – Iti Vekatzvi, Chasal Sidur Pesach, Vhei Sheomda, and Leshana Haba Biyirusholayim. Arrangements: Pinchas Leibowitz, Shmuel Benyamin Weiss. Producer: Institute of Shirei Zimra.